Soaking grains in boiling water is an old European technique. 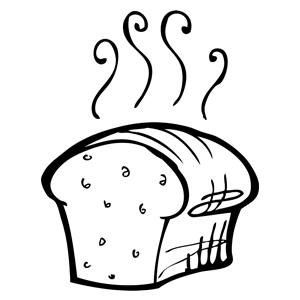 Grains absorb moisture and soften, yielding a moist and nutritious bread. Flavor is added with a hint of orange. Heat water to boiling. Place ingredients in bread pan in order listed. Select BASIC setting. Using delay feature on bread machine, program bread to be finished in 12 to 24 hours. Check dough consistency after 5 minutes of kneading. The dough should be in a soft, tacky ball. If it is dry and stiff, add water, ½ to 1 tablespoon at a time. If it is too wet and sticky, add 1 tablespoon of flour at a time. Remove bread when cycle is finished; cool. See our Bread Machine section for more helpful tips and information. Reserve ⅓ cup water. Heat remaining water to the boiling point and pour over 7-grain cereal; allow to set for 12 to 24 hours. Combine ⅓ cup water, vegetable oil, and honey; heat to 120º to 130ºF. In a medium size bowl, mix together grated orange rind, 1 cup whole wheat flour, vital wheat gluten and yeast; add liquid ingredients and moistened cereal. Beat 4 minutes on medium speed. Add enough remaining flour to make a firm dough. Knead on floured surface 5 to 7 minutes or until smooth and elastic. Use additional flour if necessary. Place dough in lightly oiled bowl; turn to grease top. Cover; let rise until dough tests ripe. Turn dough onto lightly floured surface; punch down to remove air bubbles. Shape into a round loaf. Place on greased cookie sheet. Cover; let rise in warm place until indentation remains after touching. With a very sharp knife, make 3 or 4 slashes, ¼- inch deep on top of loaf; cut crosswise, to make a crisscross design. Bake in preheated 375°F oven 30 to 40 minutes. Remove from pan; cool on rack. We used Bob's Red Mill 7-Grain Cereal, a combination of barley, flax, oat, rice, rye, triticale and wheat.